This festival marketplace offers over 150 shops, restaurants, and merchant carts in the three buildings surrounding Faneuil Hall, North Market, Quincy Market, and South Market. Quincy Market, the center building, is a great gathering spot and place for lunch, with over 35 stands offering a global food selection. During the summer months, street performers often entertain the crowds around the marketplace. Jugglers, clowns, puppeteers, musicians, and magicians are just a few types of entertainers that can be seen on the cobblestone promenade. Boston Harbor Cruises has been introducing visitors to the Boston Harbor since 1926. Today they are New England’s oldest and largest cruise company. Boston Harbor Cruises offers Whale Watching, Sightseeing, Lighthouse, and Sunset Cruises, in addition to fast ferries for private functions and general entertainment. 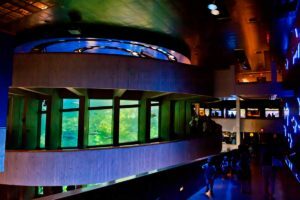 The New England Aquarium, located in Boston has more than a dozen exhibits featuring marine life from around the world. By recreating the natural habitats, including reefs, pools, and rocky shorelines, Boston’s Aquarium offers visitors an incredible opportunity to view hundreds of species. In Boston since 1989, the Hard Rock Café has over 300 pieces of Rock’n Roll memorabilia from local and other artists. The Hard Rock Café logo is the 2nd most recognizable in the world. The restaurant chain began with a sole American diner in London. When Eric Clapton became friends with the two owners and they suggested putting up one of his guitars on the wall, a trend began. A week later a guitar from Pete Townshend arrived in the mail, and after that the memorabilia kept coming. There are now over 130 Hard Rock Cafés.